The class of 2019 performs the co-ed dance. Seniors Lauren Campbell, Eden Vanslette, and Dale Lippincott choreographed this years dances. As many students at WHS prepare for upcoming spring sports, the Class of 2019 is hard at work with a different type of preparation. This week, the senior class will be performing their Senior Show on March 22 and 23. The Senior Show is an annual performance put on by the graduating class full of skits, videos, dances and a lot of comedy. This year’s directors are seniors Jake Tyska, Lizzy Francis and Andrew D’Amico. “My role is to kind of organize the skits, come up with certain skit ideas, cast members for the skits, [and] answer any questions anyone has,” Tyska said. According to Francis, there is an extensive list of roles and responsibilities she has as a director. “Essentially what I’m doing is kind of organizing the show, mapping it out, choosing the skits, [and] writing a couple of the skits. I’m going to be casting and kind of just building everything together,” Francis said. One of the steps in organizing the show is assigning each participating senior with a role in the show. With differentiating interests, abilities and comfort zones, this can be a challenging task. The survey addresses not only the students interests for the show but also their availability and willingness to perform. “Within the survey, we ask if they’d like to perform on stage or off stage, and then we kind of find a way to make sure they get what they want [in] at least one part of the show,” Tyska said. Seniors who are uncomfortable with performing or have a time conflict are still involved in the Senior Show experience. With expectations of an entertaining show, another major challenge for the directors is to manage the content. “The biggest challenge is agreeing on [the content] and making sure that what we’re doing is original and that it satisfies the expectation needed,” Francis said. In terms of content, there are a strict set of rules concerning which topics are allowed to be included in the show, and the manner in which they are included. Enforcing these regulations are not only the directors but also the Class of 2019’s advisors, Media Center director Joanne Schmidt and history teacher David Schmirer. “[Schmidt and Schmirer] make sure that we’re getting our work done on time and that what we have is appropriate for everyone to see,” Tyska said. Schmidt and Schmirer oversee the preparation and production of the show to make sure things are going smoothly. 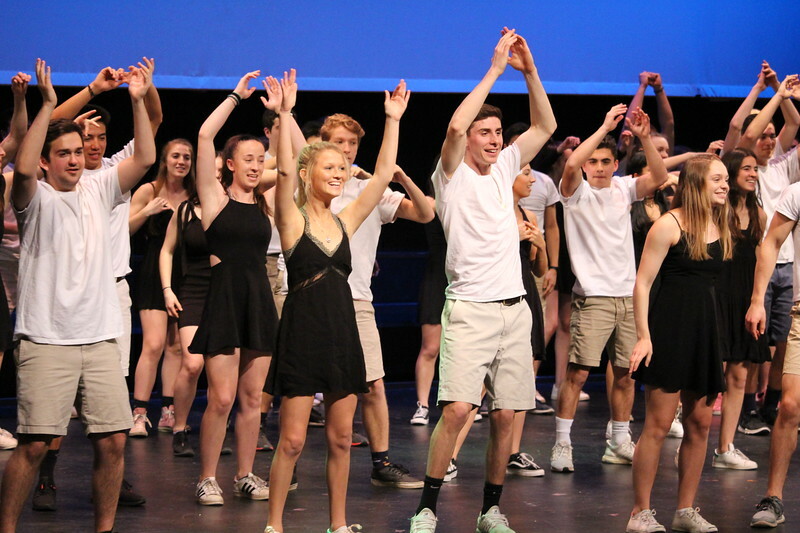 With lots of hard work being put in by the directors, class advisors and members of the senior class, the directors are optimistic about the show’s debut. This story was originally published on Wayland Student Press on March 19, 2019.